Yesterday, while grocery shopping, I ran into a woman I first met over a decade ago. I will call her Liza here. I met Liza at a health seminar and she was interested in some products that I sold back then. My products were unique and rare, so I usually had to spend time with each person to demo them and train buyers in how to use them. Liza was excited at the prospect of me working with her, but instead she was highly disappointed when I tried to talk her out of it. You see, I knew that one product she wanted would not only require personalized training, but also it would not really help her. I had consulted with unsaved as well as saved, Christians as well as people of many other religions, such as Jews, Buddhists, Pagans, and some without a definition, as well as agnostics and atheists. All of them benefited as well as the others using the products. BUT from years of experience, I had found that there were people, who seem to only improve a little and barely maintain that. It was not the product that caused this nor did it pick and choose people that would benefit based on their beliefs, but rather it was the people causing their imbalances that would not correct in their health because of what they believed. These were the people who believed they were Christians, but were not saved. (I can discern this.) Also, in this category were former Christians, who had willfully rejected Christianity. No matter how many different ones I tried to help, they never achieved their goal and only had temporary or subtle improvements and then barely maintain that level. It was so disappointing that after much prayer it was obvious that I needed to be choosier about who would I would agree consult and train. People could still buy the products through my website with detailed instructions, they could even order evaluations, but these were not guarantees that I would help with personalized instructions. Liza was local so I demonstrated the products to her in person. She was impressed and bought a few of the kind that did not require any training to use. However, she also wanted the product that did. Liza had painful arthritis through her body although she was in her early forties with children in grade school, so it was very hard to tell her that I would rather not sell her the product and even if she bought it, I would not provide personalized instructions. I was praying the entire time that God would give me the words He wanted her to hear. You see, God had already shown me that she really was not a believer, just one who believed she was. Liza believed absolutely she was a Christian, but she was married to a man that was of another religion. I asked her how that worked in their family and she told me of how they had agreed to go to a Unitarian church. She believed that many religions believed in the same God and could worship together, which was confirmation of what God had already revealed to me. I was surprised by the words that came out of my mouth, because I am not often confrontational, but I had given this situation completely over to God. I heard myself say that I would not work with her because I knew she would not get better, and the reason for that was because she believed she was a Christian and she was not...which I said rather sternly, not the tone I would have chosen in this situation. I do not think a potential client has ever looked at me quite that way before or since. She walked out obviously in a huff and I just continued to pray for her whenever God brought her to mind and one day I just knew that she had accepted Jesus. A year later, I saw Liza at another health seminar. She made a point to come up to me afterward in the parking lot. The moment I looked at her face, I could just see it. She glowed. The change in her was so very obvious. I even said to her "there is definitely something different about you." The first thing she told me is that she had become a Christian. During that year, she became infuriated when a speaker at the Unitarian Church had thrown down the Bible and said they did not need it. She had always been where the scriptures were held in high reverence. She had also begun reading the Left Behind series. 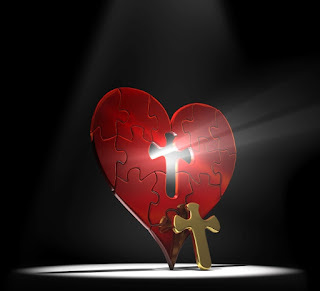 Searching God's heart, she began going to an intense Bible study that went through the Bible book by book. One day at the Bible study, she accepted Jesus into her heart. I smiled and said I could see that (although I already knew)! Then she told me, "But, I want you to know I really thought I was a Christian." Then she began to cry. Her husband being a different religion forbade her to talk about Jesus to their children. I cried with her and said that this was what I would have expected with a Christian so unevenly yoked and that I was so sorry for the sorrow she had then because she had become a true believer. Another year passed and we ran into each other at the health food store. Her marriage had come apart and her relationship with her children was strained, but she still glowed...and Liza had no more arthritic pain at all! You see, her health issue was manifesting from her previous self-deception and that is why nothing she had tried really worked, nor would have mine. I have seen this many times before and since, how a person in deception or living with another in deception, believing they are Christians when they really are not, will heal from his debilitating health condition (some were never clearly diagnosed) after becoming a Christian for real or leaving the one who is not. I still sometimes doubt myself and I definitely have people around me who doubt it, doubt this gift, but then I remember Liza and a few other people from whom I was given clear confirmation and I just trust my God. So, when people tell me that only God knows a person's heart, I just smile. If God knows then He can make it known to whomever He wishes. He is God after all. Still, there are people in our churches that talk the talk and even seem to walk the walk, but do not have it in their hearts. They believe they are Christian, really believe it, they are so deceived...but God is not. We do not need to weed them out, but help them come into the fold. My Lord, thank you for giving me this gift. At times I do not want to use it, but I know You wish me to do so. I need to help You guide the lost into truly accepting You. I have seen this too ~ though I do not have your gift of discernment & can only gauge the state of a person's heart by their actions [By their fruit you will know them]. I believe many, many are so deceived & it is terrifying. Psst! You can ask me. Distance is not a factor. There was a very likeable man who was running for an office recently and he is well-known for his generosity and kindness, especially when it came to spending time with people going through a tragedy. He believes he is Christian, everyone believes he is Christian, I even believed he was Christian based on his Bible knowledge, talk and walk--the fruit, but when I used this gift...well, I had to ask God several times if I was getting it right because it was so hard for me to believe for myself, but he was not a Christian. I still go back and test that because it is just so hard to accept. I have known quite a few pastors who have confessed that they were not saved until sometime during their ministry. Some people have just enough knowledge to fake Christianity so well that they do not understand that they are using it to avoid accepting Christ. But, then again, there is no fooling Father God.